today the organization includes men and women representing all social, economic, and geographic cultures. promotes men and women coming together as a unit, organizing our neighborhoods, becoming more active and visible in our homes and communities, and being good examples and REAL role models for our children. Our goal is to mobilize the city, trying to eliminate violence, drug use, and gang activity, from one house to the next. We will raise the level of public awareness to strengthen and rebuild the family unit while addressing community apathy regarding crime and violence. M.A.D. DADS will work with any church, organization, agency, or group who are concerned about making a better future for our young people and community. social ills that plague neighborhoods. MAD DADS employs strategies that engage men and women in the intervention and prevention of community problems. Our operations, partly funded through bike sales and tune-ups, allows MADDADS to donate hundreds of bikes to children annually through our various programs. You can find a lot of our inventory on craigslist , this website (coming soon), or by stopping by and seeing us. We have everything from beginner bikes to professional road bikes and stylish rides for both adults and children. Every bike that comes through our shop receives a thorough refurbishing. We also offer guaranteed tune-ups for just $50 plus parts. Tune-ups include checking and greasing of bearings, and adjustment of brakes and gears. Bring your bike in and let our capable shop guys adjust and grease your ride. It will make a big difference in the performance of your bike. for an average cost of $30.00. These bicycles are then donated to children attending Lincoln schools, grades 5 through 9.
children, Winnebago, Santee, and Omaha children, Matt Talbot families, Friendship Home patrons, and other organizations. Since our first donation in 1995, we have donated over 7,000 bicycles to those in need throughout the state of Nebraska. 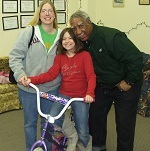 In addition to giving bikes away throughout the year, M.A.D. DADS has a bike program specifically for Christmas. Each year 5th graders from 10 Lincoln schools (public and private) are asked if they are in need of a bicycle. 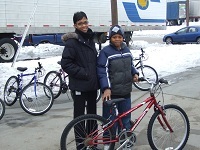 Students who desire a bicycle are put on our list to receive one for Christmas. 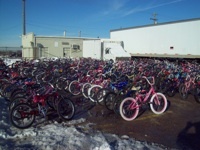 We have donated over three thousand bicycles for the Christmas program. official, church member, or concerned citizen. This program is designed to show young people an alternative to crime by promoting positive lifestyles. Directors will instruct the girls on grooming, personal hygiene, and the negative effects of drugs, alcohol and tobacco. Symbolic of unity, togetherness and support, bringing all of us together as one. Symbolic of life, growth, living, hope and our faith in God and our future. Symbolic of the purity and gentleness of our children and their souls, for the kindness and morals instilled upon them to love all creatures, large and small, on our great earth.